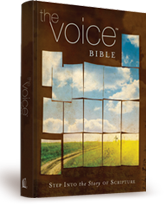 Back in February, I won a New Testament copy of "The Voice," a new translation of the Bible published by Thomas Nelson, and I've been reading various portions of it between then and now. The official website of The Voice says this is a "translation that reads like a story with all of the truth and wisdom of God's Word. Through compelling narratives, poetry, and teaching it invites readers to enter into the whole story of God with their heart, soul, and mind. This bold new translation engages readers like no other Bible." And, the Translation Team consists of a large group of men and women who are Pastors, Professors, Lawyers, and Writers. So, it is not just one or two people participating in this project, but many. Jesus: You'd better be on your guard against any type of greed, for a person's life is not about having a lot of possessions. (then, beginning another parable) A wealthy man owned some land that produced a huge harvest. He often thought to himself, "I have a problem here. I don't have anywhere to store all my crops. What should I do? I know! I'll tear down my small barns and build even bigger ones, and then I'll have plenty of storage space for my grain and all my other goods. Then I'll be able to say to myself, 'I have it made! I can relax and take it easy for years! So I'll just sit back, eat, drink, and have a good time!' Then God interrupted the man's conversation with himself. "Excuse Me, Mr. Brilliant, but your time has come. Tonight you will die. Now who will enjoy everything you've earned and saved?" What's wrong with this, you might ask? Well, there's nothing particularly wrong with it, except for the fact that the meaning is somewhat changed. In the major translations (NAS, KJV, NKJV, NIV) verse 20, which is highlighted above, uses the words "You fool!" to describe the man's ignorant actions and his egotistic way of thinking. Somehow, the thought of God saying, "Excuse Me, Mr. Brilliant" (which sounds like sarcasm to me) just doesn't convey the same idea. God wasn't intending to be sarcastic in this passage. He was strongly rebuking the man for his selfish and greedy actions. Maybe, to some, this change isn't a big deal. But, it just leaves me feeling a bit uncomfortable with leaving it in the hands of a new Christian. As for the format, I liked how this translation was written in a play script format. It helped to show exactly who was speaking in different events. But, one thing missing in the format was a title or description at the beginning of each chapter. It was difficult to find specific chapters I was looking for because it was written like a play and not like a Bible. Some may like the format but, for my organized way of thinking, it made things more difficult. That said, I wouldn't throw this Bible out the window. I understand the idea of this new translation, and applaud their efforts in wanting to make a Bible that is worded in today's language. It could be good to use alongside another translation, or possibly for doing a narrative in front of people. It just wouldn't be my first choice for a Bible to study with, or to read on its own - at least not without first knowing what other translations say as well. Thanks for letting us know about this new version and for sharing your wise insights. I appreciate getting your overview. YOU are insightful. Weak believers or those searching will not know the depth of what you are talking about. What a blessing it is to see great apologetic work and discernment these days of tolerance. Keep the truth! Keep it going! Vicky, I have been extremely cautious about some of the newer translations. I have found some things like this as well. Little subtle things changed that someone without a good grasp on scripture would not notice and those little subtle things can leave an opening for bigger things. I am not sure of the translation that a friend of mine quotes from, but that version even has curse words. It is nice to get a fresh perspective sometimes, but caution is needed whenever man made interpretations are added. Good post!!! !